Powers/Abilities: Timestream can manipulate temporal energy for a variety of effects. He can travel forward or backward in time, and into alternate realities, as well as into the timestream itself, at will. He can also infuse others with temporal energies as well, transforming them into past, future, and even alternate future versions of themselves. He can shift himself partially out of reality to allow attacks to pass through him, and he can heal himself from injuries by shifting his own body back or forward in time--or whatever he does! He has access to a large arsenal of advanced weaponry from his own and other futures. He tended to carry the Technosword, an energy sword, although its exact abilities are unknown. He has often recruited cyborgs and other warriors from various temporal periods and differing timelines to serve as his agents. Lastly, Timestream seems to have been mentally destabilized by his mutations and/or his adventures. Even before all that, though, he still spoke Yodish, i.e. "Out of time you are." (Captain America I#288 (fb-BTS)/Deathlok II#34(fb), 34) - Henry Akai was one of the head technicians for the Nth Command, a subsidiary of the Brand Corporation, which was itself a subsidiary of the Roxxon Oil Company. Akai's work culminated in Operation: Purge. One day, several units of Nth Commandos had made synchronized attacks on the headquarters of the Fantastic Four, Avengers, X-Men, and Defenders. Using Nth Projectors, all of these adventurers were displaced to alternate realities where they would soon die. Also, individual metahuman adventurers had been hunted down and similarly teleported. Roxxon, with no metahumans to worry about, attacked the U.S. government, intending a quick coup d'etat. Akai was threatened with assassination by his future self, Timestream, who thought that by doing so he could undo the blunders of his youth. He was defended by a time-traveling group that included Deathlok the Demolisher, Michael Collins (the Deathlok of Earth-616), and the future version of his fellow Nth Commander, Godwulf. These men successfully protected the younger Akai, allowing him to fulfill his destiny as he was caught within a power surge of the Nth Generator, which granted him the temporal powers to become Timestream. The Nth Projectors consumed so much power that it had taken a long time to generate just the power for Operation: Purge, so using them for the planned coup d'etat was out of the question. Roxxon thus relied on more conventional weaponry for their struggle against the U.S. government. A prolonged struggle resulted. Using his powers, Akai acquired the monarchy of Japan, and he benefited greatly from the ensuing wars that decimated much of the USA. (Astonishing Tales#36, Captain America I#286-288 - all BTS) - Timestream acted as silent partner to Godwulf in his battle against Hellinger, which eventually succeeded. (Deathlok II#32 (fb)) - Godwulf led Deathlok and the Redeemers on a mission to oppose Timestream, a foreign monarch, who was at the time unidentified to all others involved. They successfully destroyed his command center (from which he had launched his cyber-tank army), but all of the Redeemers were killed in the struggle. Deathlok and Godwulf were the only ones to make it out alive. The retaliation for this mission led to massive nuclear attacks from three sides. After learning that Godwulf had been withholding information from the others, Deathlok separated from Godwulf. (Deathlok II#34 (fb)-BTS) - Following the nuclear war, Timestream was banished from his own Earth. (Deathlok II Annual#1 (fb) - BTS) - Timestream traveled to Earth-9208 where he tried to overpower Emperor Richardson, the leader of a Technocracy. Timestream began to recruit a number of warriors from different eras of Earth, his Bangers, to assist him against Richardson. (Deathlok II Annual#1) - Timestream sought to recruit Deathlok the Demolisher to assist him, but apparently miscalculated and recruited Deathlok/Michael Collins. Timestream led his newest group of Bangers against Richardson's fortress. Collins, however, learned the full story from Richardson, and turned against Timestream. Collins got the drop on Timestream and had him hanging from a high platform, but Timestream pulled out of his grip and teleported away in mid-fall, swearing they would meet again, with a different outcome. (Deathlok II#33 (fb) - BTS) - The Time Variance Authority commissioned Godwulf to capture and execute Timestream for his threats to the temporal continuum. Godwulf defeated Timestream, but gave him the option of life imprisonment. Timestream accepted that option and later escaped. BTS - Timestream set up a base in Australia of Earth-616, to which he summoned an army of cybernetic warriors. (Deathlok II#27, 28) - Timestream located Luther Manning of Earth-616 and told him that he was supposed to have become Deathlok. He then infused Manning with temporal energy and left him, telling him that things would be set right. Timestream's Australian base was discovered and attacked by Siege, who was seeking vengeance on cyborg criminals. 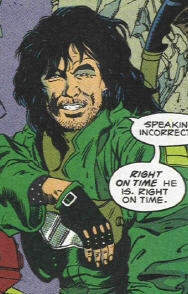 Siege was assisted by his associate, Michael Collins, who fought their way into his base and confronted Timestream. Timestream immobilized both of them in an energy field and told them to be prepared for what was coming next--as the world was swept over by waves of energy released by the Goddess. Timestream had identified this time period as the time when the heroes of Earth had left to fight in the Infinity Crusade, and so had chosen this time because he could conquer the Earth without the heroes' interference. Siege explosively broke free from the energy field, stunning Timestream, but Collins/Deathlok was otherwise occupied with visions of the Goddess, who told him he had lost his purity and was no longer worthy of her grace. 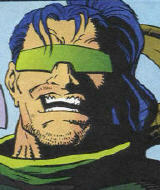 Timestream attempted to recruit Siege to his side, but Siege possessed Collins' memories of his previous encounter with Timestream and so knew his true nature. Collins returned to reality and joined the fight, but Timestream summoned his cyborg army to fight his opponents. 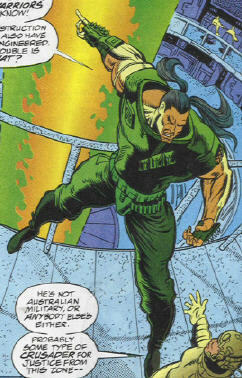 While Siege fought the cyborg army, Collins plugged into Timestream's computer system and determined his plan: His base contained a transmission station able to control planetary tidal flow, which he intended to use to flood all seven continents, starting with Australia--leaving him with a clean slate to ease his takeover. Deathlok managed to shatter the transmission platform, and Timestream teleported away after realizing his initial plan had been thwarted. (Deathlok II#29) - While Deathlok/Collins continued to deal with the effects of the Infinity Crusade, Timestream sent a missile that exploded nearby Luther Manning-616 and filled him with more chronal energy, which initiated his conversion into a cyborg. Timestream then returned to Earth-Deathlok, some 18 years after Hellinger's defeat, and brought Deathlok the Demolisher back to Earth-616. (Deathlok II#31) - Timestream recruited Manning-616, whom he had placed into an internal timewarp for a few weeks. 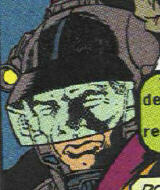 Manning had completed his conversion into a Deathlok-type cyborg, and Timestream placed a computer card into Manning's system, placing him under his control. 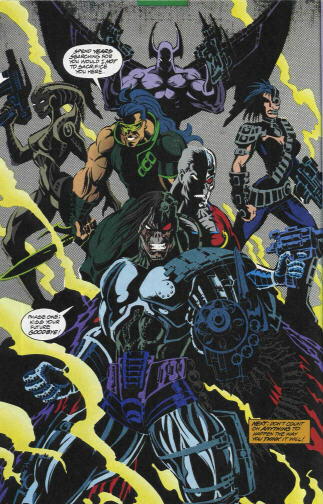 Timestream then brought Manning-616 and Deathlok the Demolisher to join his band of mercenaries. He convinced the Demolisher to join by telling him he could return him to his life before becoming a cyborg. He then sent his army to into the past of Earth-616, to kill Captain America and Deathlok the Demolisher (during the events of Captain America I#286+287), to prevent them from stopping Operation: Purge for occurring on Earth-616. (Deathlok II#32) - Godwulf, who had recruited Deathlok/Collins and Siege, fought Timestream and his army. They successfully delayed Timestream and his agents, allowing the past versions of Cap and the Demolisher to travel to the future of Earth-Deathlok (for the events of Cap287+288). Godwulf shot Timestream with an arrow, hoping to kill him, but Timestream's powers allowed him to survive. Timestream then unleashed a temporal vortex that pulled all of the remaining combatants into the timestream itself--the junction point of all time and dimension. (Deathlok II#33) - While his army fought off his opponents within the timestream, Timestream initiated plan three: He brought his group of cyborgs back into the past of Earth-Deathlok, at the time of Operation: Purge. He planned to slay his own past self and by doing so erase the mistakes of the past and start anew. (Deathlok II#34) - Manning-616 died, and the Demolisher turned against Timestream. After his remaining allies incapacitated the Demolisher, Timestream led them into Nth Command, where they found the young Henry Akai protected by Deathlok/Collins, Siege, Godwulf, and the Demolisher. Akai's defenders routed the rest of Timestream's army and the Demolisher skewered Timestream with his own technosword. However, Timestream healed himself and threatened to overpower his foes. Deathlok/Collins then turned an Nth Projector on Timestream, and the energies--which had been the cause of his powers initially--overloaded his own powers, causing him to vanish into parts unknown. After everyone else was returned to their own worlds, the Nth Generator overloaded from the backlash of energies caused by Timestream's powers, and it exploded, exposing the younger Akai to the energies that would turn him into Timestream. Comments: Created by Gregory Wright, Jackson Guice, and Jimmy Palmiotti. In Deathlok II#34, Timestream appeared to have traveled directly into his own past. In general, when the past is "altered," the present is not actually changed, but rather a divergent timeline is created, one in which those alterations did occur. On occasion, however, certain individuals can affect the true past. What would have happened had Timestream actually slain his past self is thus uncertain, but since he didn't the point is moot. Since the past was not significantly altered, I see no reason why it can't have actually been the true past of the Earth-Deathlok timeline, and thus Timestream's past as well. As always, it is difficult to do chronology for a time traveler. Timestream didn't have anything to do with Earth-Deathlok when he first appeared, but seemed more likely associated with the world of Emperor Richardson. I've tried to fit that adventure in where it seemed to make the most sense. Both Timestream and Godwulf got in trouble with the TVA after precipitating nuclear war. It was then that Timestream was banished from Earth, and could have gone to other worlds. Later, Godwulf was sent to punish Timestream for his time traveling infractions. That could have happened either before or after Deathlok Annual#1. Anyway, this is giving me a headache trying to figure it out, so I'll let it go it at that. Also, the Henry Akai of Earth-616 has not been seen yet, but I would imagine he went to prison after Operation: Purge was foiled in Captain America I#289. Timestream received an entry in the All-New OHotMU Update#4. They are various groups of extra-dimensional temporal warriors, many--but not all--of whom are cyborgs. Timestream recruits them to his missions via a variety of promises, such as returning them to normal, or the gaining of further power or wealth. However, when it comes down to it, they're always expendable to him. He did seem to dig Jayne Riviera, though. He comes from a future world where he is part of the Lunar City Seven Defense Squad. He participated in the struggle against Emperor Richardson on Earth-Technowar. He is proficient with a variety of advanced weaponry. He was summoned from the past, apparently from the Civil War. He participated in the struggle against Emperor Richardson on Earth-Technowar. He is a skilled marksman and soldier. She was summoned from an unknown future world, where she was part of the United Eurasian Federation. She participated in the struggle against Emperor Richardson on Earth-Technowar, where she seemed to have the closest attachment to Timestream of any of the Bangers. 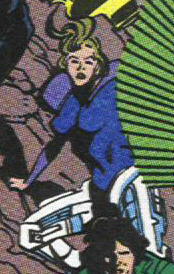 She attacked Deathlok/Collins, who blew off her mechanical legs, but made certain not to injure her robotic limbs. She is a skilled warrior. Her Cybertran� legs possess superhuman strength and can reconfigure themselves into anything from a wheel, to an egg-leg shield with which she can surround and protect her entire body.